New York : Random House, c1976. 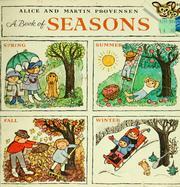 A book of seasons / Alice and Martin Provensen. 100 ME:PersonalName 1 $a Personal name Provensen, Alice. $c Statement of responsibility Alice and Martin Provensen. $c Date of publication, dist, etc c1976. 520 Summary $a Summary, etc. note An easy-to-read description of the continuously changing seasons. 650 Subj:Topic 1 $a Topical term Seasons.